Sri Lankan Airways offered an upgrade to business class which provided a wider seat, longer legroom, stiffly-starched napkins, china crockery, metal cutlery and tiny little salt and pepper pots. On the downside, I was placed next to a gentleman that had astonishingly pungent armpits. Half an hour after take-off, the stewardesses took orders for drinks that were served just before the meal. Having adjusted my watch to Sri Lankan time, I realised I was quaffing (albeit very tiny) glasses of red wine at 08.30 in the morning. During the flight, I found a pamphlet in the seat pocket on ‘Offences to Avoid Onboard an Aircraft’. In addition to the the usual tampering with smoke detectors or assaulting crew members, there was the act of engaging in 'indecent behaviour in any part or section of the plane'. I wondered why it stipulated 'in any part of the plane'. The diagram for this crime showed a man with his feet on the seat in front with his knees in his chest, clasping his shins and looking up at the roof of the cabin with a wry smile on his face. 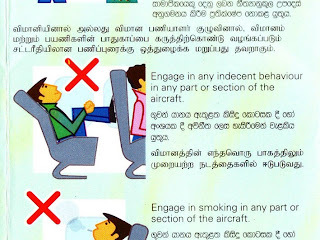 I am not sure what sort of lewd activity this represents, but I shall watch out for such behaviour on future flights.